Day three was action day. Woo hoo!! 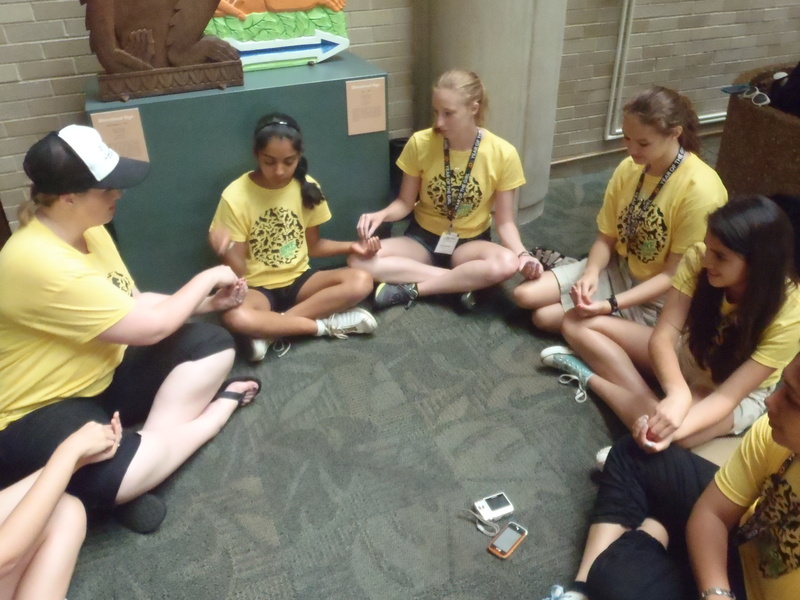 We split up into six groups and took our trusty buses out to different action sites to do service and learn about different programs happening around Chicago. 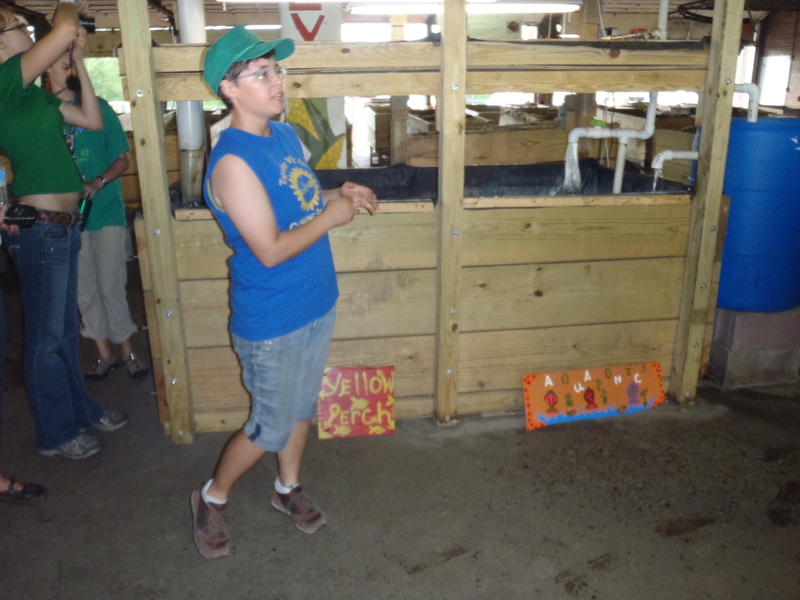 Ali and I went to Iron Street Farm, the Chicago center of an organization called Growing Power. Julia went to a community garden set up by Chicago Cares, an organization that sets up different volunteer opportunities around the city. I really enjoyed this trip. We arrived and right away started working. 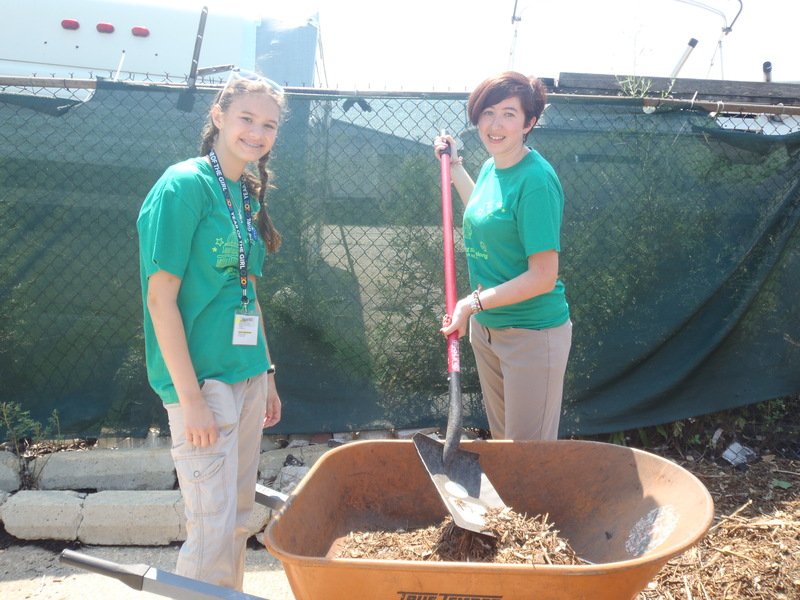 We shoveled wood chips, which are “donated” (dropped off) by tree cutting companies, into wheelbarrows and took them to the greenhouses. Ali and I working hard on Iron Street! These woodchips are the foundation for the farm. 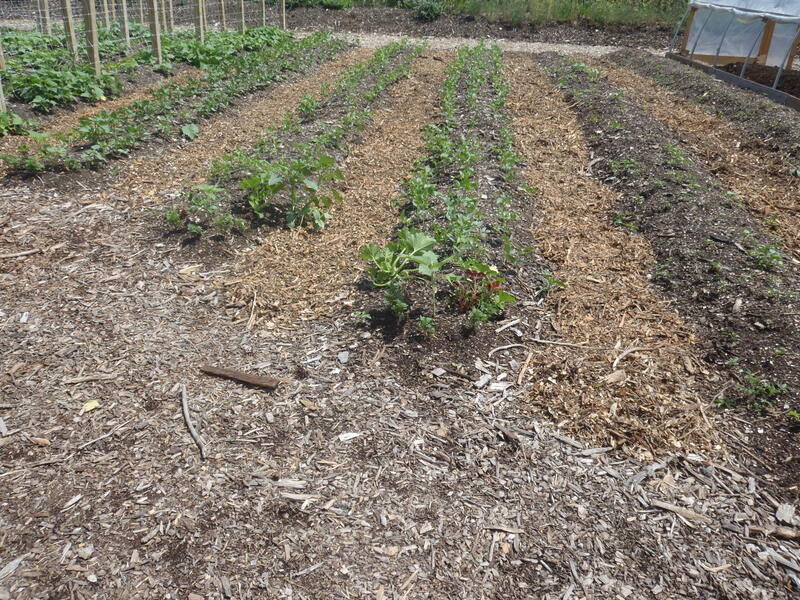 Most of the area they plan on is concrete, so they lay down the woodchips and then soil over top of it to plant on. After working for about an hour, we broke for lunch. 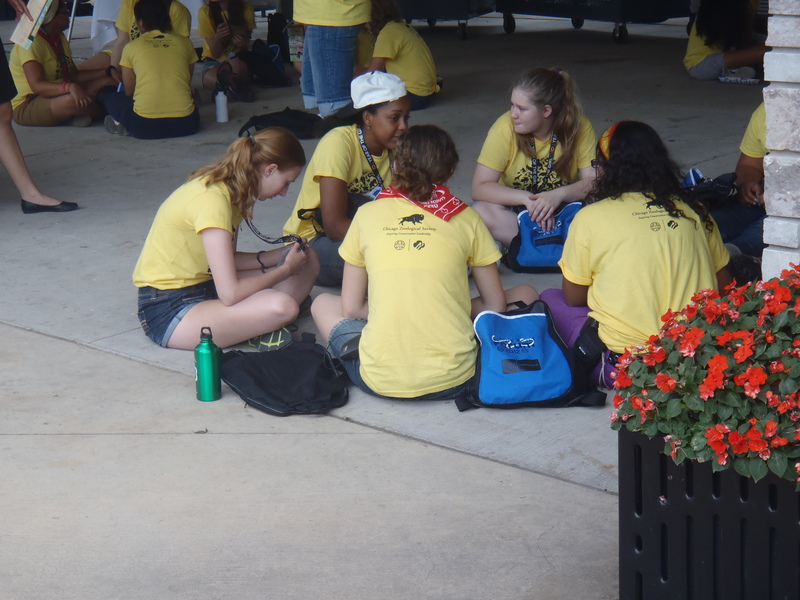 We took full advantage of the AC on the bus and I had some great conversations with other chaperones and volunteers about working with council on these international and WAGGGS initiatives. Some councils are establishing a WAGGGS liaison position, and I think that is wonderful. I hope it becomes commonplace for girls, and adults for that matter, to know what the pins they wear on their uniform represent. After lunch, we got a tour of the entire facility at Iron Street. Our tour guide was Erica, one of the staff members. She was a really great guide, very knowledgeable about everything they are doing, and she explained it in a way that even I, who know next to nothing about gardening or farming, could understand it. Our awesome tour guide Erica! 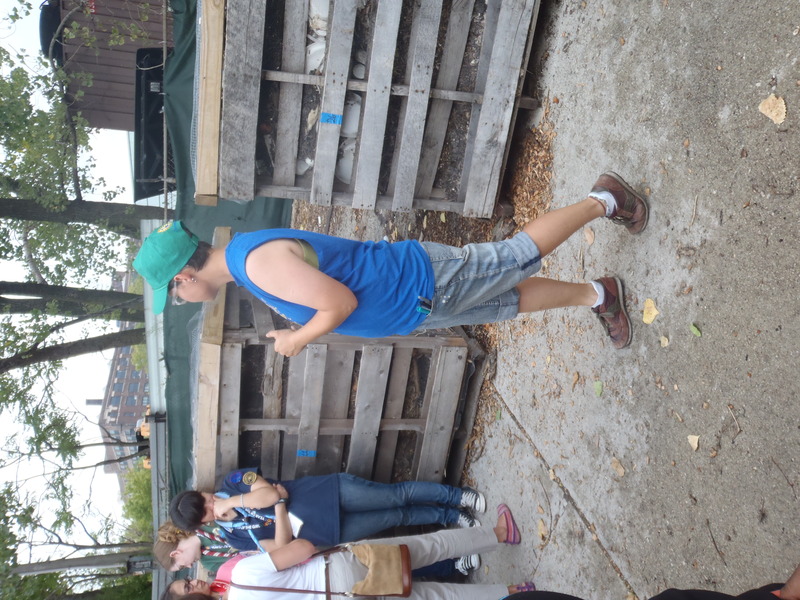 In the picture above, Erica is standing in front of their compost pins. They are made from repurposed wooden pallets and screens. They layer woodchips and compost material (food waste minus meat, dairy and bread) in the bins to create the compost for the entire farm. They get the food waste from restaurants, breweries, and the community at large. Just a note, I’ve been looking around the Growing Power website and it has a lot of great information on all this stuff if it is something you’d like to learn more about. 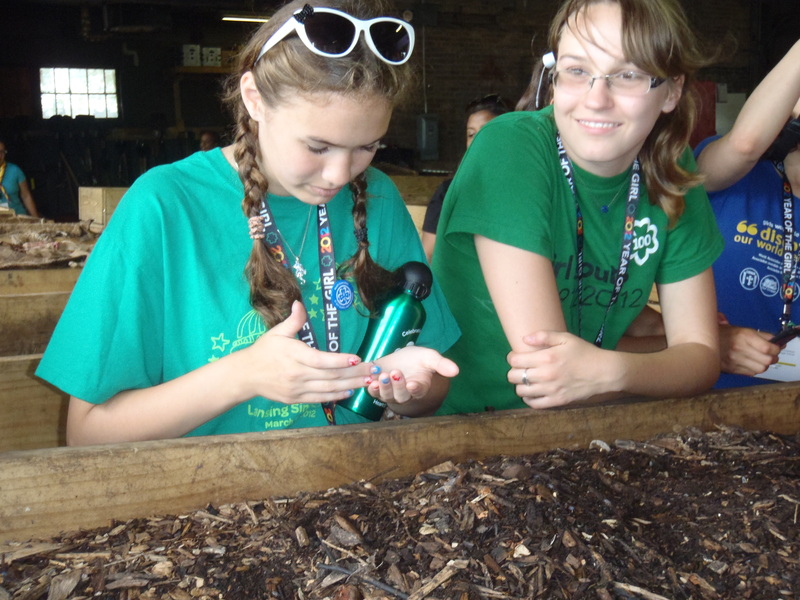 Next we went inside to see some the vermiculture. Vermiculture is pretty much partially decomposed compost with worms in it. The worms speed up the process by eating and…well, pooping. They can eat their weight each day, and reproduce fairly quickly. Again, there is really great info about these worms and the process on their website. Next up: aquaponics. What? Yeah, that’s what I said. Basically, it’s a system where water circulates with a pump from a fish tank on the bottom up to plants on pallets on top. The pallets are on a small incline, so small that you can’t really tell in the picture, so that the water flows down. The pump just moves the water, it doesn’t need to be cleaned because the fish poo helps fertilize the plants, and the plants clean the water for the fish. Growing Power then sells the fish and the watercrest (or whatever they grow on top) to help funding. Here’s a picture of the top, where the watercrest is growing. Erica said that aquaponics is very easy to scale up or to scale down. If you already have fish tank at home you could easily add plants on top, or you could make a system even bigger and raise bigger fish. 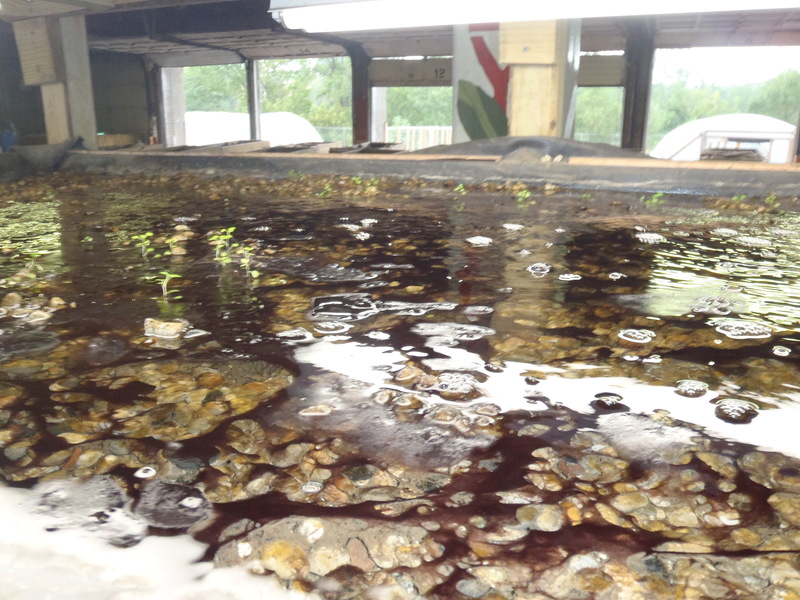 At Growing Power they mostly raise tilapia and yellow perch. Ever heard of a mushroom chandelier? Well neither had I until I went to Iron Street. In order to be more space-efficient, Growing Power plants their mushrooms hanging from the ceiling. 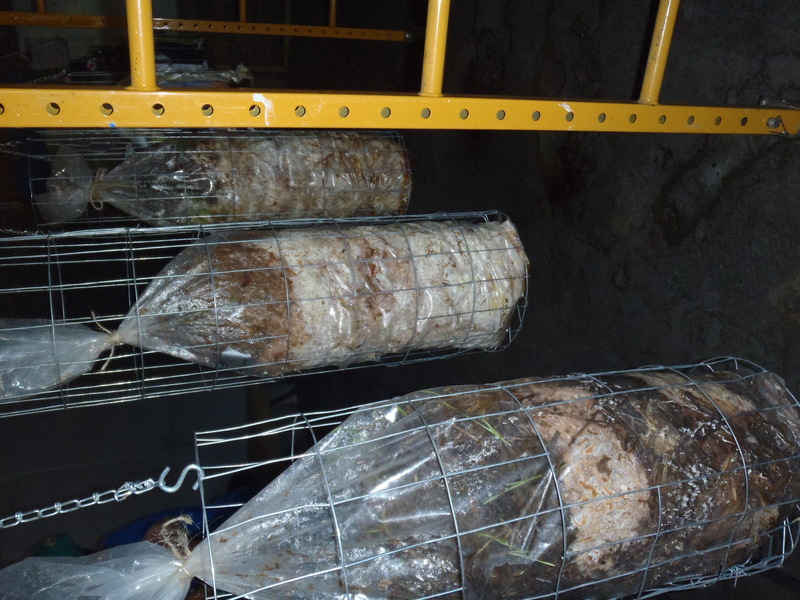 They layer mycelium (mushroom “seeds”) and woodchips in bags, then hang them up. After a while, they cut holes in the bags which the mushrooms (mostly oyster mushrooms) grow out of in bunches. None were sprouting just then, but here are the chandeliers. Do you think these would go well in my foyer? 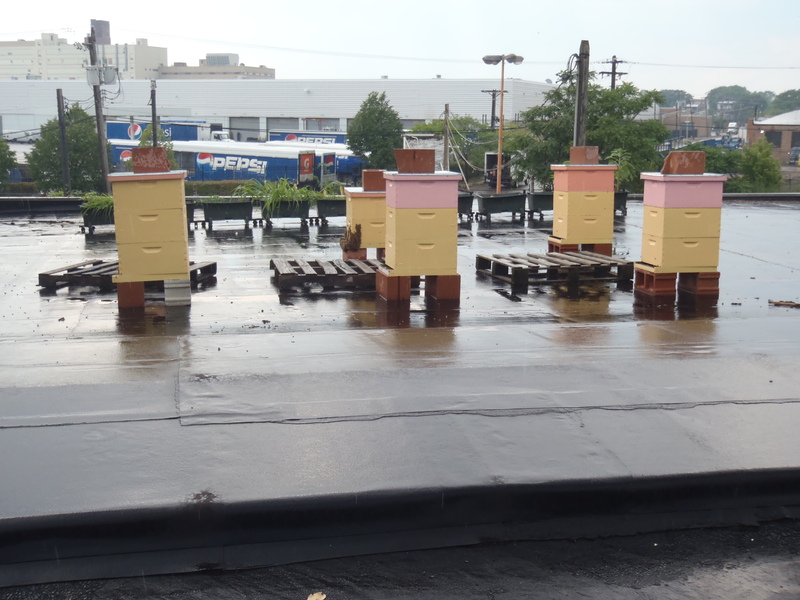 Ever efficient, Iron Street has even used its roof to house six bee colonies. They produce 150 pounds of honey each year per colony, which they again sell. They also use the beeswax to make candles and beauty products. So, I would like to say a special thanks to Growing Power for letting us visit and showing us around. They are a really great organization helping to show that you can grow your own food sustainably anywhere. I encourage you to check out their website and take a closer look at where the food you eat is coming from. I’ll write more about Julia’s experience tomorrow, and try and find someone who has pictures of her. Thank you all for reading, tomorrow I’ll write about International Night which was so awesome, and there will be great pictures. If you can’t get enough GWF, check out the brand new flickr site, which will hopefully be updated all the time as word gets passed around here that it exists. Most of my pictures are up there, as well as some from the WAGGGS photographers here. Don’t forget to comment and subscribe, I love hearing from you!